Hate clutter? Procrastination makes it worse. I’m too tired to go through the mail right now. I’ll make that appointment tomorrow. I’ll just stick all of the tax documents over here and get started on that this weekend. Let’s leave the dishes until tomorrow. I’ll return that shirt next week. I won’t lie, these are all statements I’ve made. We are tired, we are busy, we are stressed. Putting every single thing away every single day seems like some kind of type A craziness. Sometimes a body just needs to relax. I know! I am all for self-care and sometimes just letting the dishes wait. My house is never spotless and my to-do list can become truly epic. But I do firmly believe that procrastination is the root of all clutter. If we paid the bills the moment they came in, we’d never lose them and we wouldn’t have so much paper everywhere. If we fixed things as soon as they broke we wouldn’t lose the critical piece of hardware only to find it months later under the couch. If we put the scissors away after using them we wouldn’t have to hunt for them the next time. In fact, we wouldn’t have to buy another pair because where the hell ARE they, anyway? Projects of every conceivable kind become clutter when we lose interest in them. Things we meant to return to stores, libraries or friends clog up the closets. Phone calls we keep putting off turn into unpleasant tasks rife with guilt. Clothing that no longer fits clutters up the drawers because we don’t want to face going through it. It’s hard to decide what to do with the fancy china your aunt left you, so it takes up space in the shelf. When I look at a cluttered room, I see a giant to-do list. It’s exhausting! Every single bit of clutter is an abandoned task. It’s an item you put down instead of putting it away. It’s the stuff you think you should hold onto, but for which there is no home. It’s the thought that you really should go through those boxes but you just don’t have the energy. Reducing the tendency to procrastinate, along with some concerted decluttering, puts you into such a terrific upward spiral. The less clutter you have, the fewer undone tasks await you. And getting things done in a timely manner reduces the amount of stuff awaiting your attention. Winning all around! I struggle with procrastination. It’s probably my worst habit. Back in January I decided that my word for the year would be EXECUTE. Meaning do instead of dream. I’m not quite where I want to be, but I’m working on it. Setting deadlines and having stern talks with myself. So I challenge you to do one thing today that you’ve been putting off. See if you can get into the habit of confronting that clutter instead of just glaring at it. Let me know what you did! And how it made you feel! I would love to cheer your success. No, You Don't Need to Go to the Container Store. No shade, I love the Container Store. Who doesn’t? All those beautiful boxes and bins and folders and tools, color-matched and uniform. It makes you feel more organized just walking the aisles. But don’t be fooled. Organizing your home is a process, it is work. You can’t shop your way out of it. I’m a huge proponent of using what you have on hand. Here are a few things I’ve put to work as drawer organizers over the past month: a tea tin, the lid from a box of postcards, small cardboard boxes that once held business cards, small canning jars, ramekins, and the box that housed my new phone, to name just a few. They are not all beautiful (though some are) but they were all free. And available! Here are a few things I’ve purchased in the past month as part of my grand kitchen reorganization: five (count ‘em, FIVE) lazy Susans, a dozen glass storage boxes, three dozen magnetic spice jars, and two pieces of sheet metal. It’s not that I’m against buying any stuff at all, but I want to know exactly what I need BEFORE shopping. One of the issues my clients have with clutter is that they don’t want to add to the landfill. Sustainability is important to denizens of the great Northwest. I applaud this! Reusing the stuff that’s kicking around your house is the very epitome of sustainability, while buying stuff just because it looks cool is what got us into this mess in the first place. So do me (and the planet) a favor; look around, see what you can possibly repurpose for your organizing needs, and THEN buy the things you really, really need. Finally, a word about plastic. I love following professional organizers on Instagram, but heavens there is a lot of plastic in most of those feeds. By now we should all be doing our best to purchase less of that material. (This article in National Geographic tells the story with beautiful photographs for emphasis.) I like reusing things that appear in my house, and I like using items that are made of sustainable materials. Here are some ideas from my own drawers and cupboards, all made from cardboard, glass, ceramics or metal. Batteries in a ramekin. I rarely used this in the kitchen, so this was an easy solution. 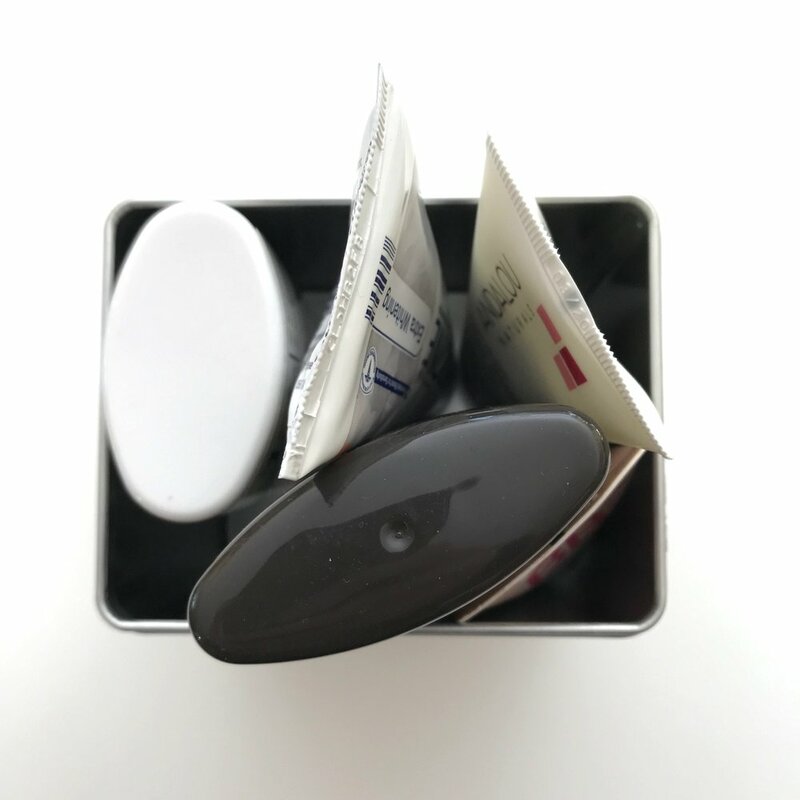 This tea tin is perfect for corralling bathroom items that get used frequently. Toothpaste, face lotion, deodorant and hair stuff at the ready, but off the sink. I use a lot of postcards, since I’m an avid participant in Postcards To Voters. I buy them in these fabulous heavy cardboard boxes with lids - all are ideal for keeping stuff organized, like this collection of pencils. I collect a lot of business cards. This combo of postcard box lid and business card containers keeps them all in line. Small office supplies are easily scattered. Keep ‘em tidy with small jars and boxes. Another postcard box holds photos - there’s little Julia! We love cheese! This brie box has a new life as another office supply organizer. What could be more appropriate than using an iPhone box to corral the chargers? Okay, you see how it’s done. I challenge you to look through the stuff you’re throwing away and see if any of it could help you keep your stuff organized. Free, available and out of the landfill: triple win. I Quit Facebook, And Now My House Is More Organized! Or, How Breaking Up With Facebook Boosted My Resolve. I’ve been struggling with my feelings about Facebook for quite a while. On the one hand, it’s a great way to stay in touch with people. Especially those people that I’m interested in but unlikely to see anytime soon. And theoretically it’s good for business. On the other - well, the reasons for me to dislike the giant are legion. I will not subject you to a treatise on why I think Facebook is the new Galactic Empire, but I will direct you to both an article and an opinion piece from the venerable New York Times, should you be interested. So there I was, on the horns of a dilemma. I finally bit the bullet one day in December; I just couldn’t stand to live outside of my values anymore. So I pulled the plug, and… Nothing. Nothing! I do not miss Facebook in the least. I do not believe that my business will suffer at all. This decision has brought me peace. And not for the reason that quitting social media is supposed to help your state of mind: saving time, lessening FOMO or the sense that everyone else is doing everything else better. But because I finally MADE THE DECISION. Sometimes I really struggle with choices. We know that having too many options can lead to paralysis, and I would argue that having too many decisions to make has the same effect. As a single parent and homeowner, I have to make a LOT of decisions. Sometimes by the end of the day knowing that I still have to choose the dinner menu makes me want to throw in the towel. And this Facebook situation, while hardly life or death, was weighing on me. Then I got off the fence, and the angst disappeared. Which reminded me that often the agony of choosing is worse than the outcome of the choice. So I made up my mind, and hardened my resolve. What, you may ask, does this have to do with home organization? Having put this particular quandary to rest, I started looking at my house with a critical eye, rather than ignoring the growing level of disorganization. I realized that organizing and decluttering depend on our willingness to make choices, and I had shut off the decision-making part of my psyche. Some household choices are hard and some are simple, but there a lot of them and we have to face them with energy and a firmness of purpose. At some point we just have to commit to doing something. Getting this one dilemma solved somehow got me back on track and reminded me that it’s the journey, stupid. If you are struggling with disorganization, I encourage you to flex your decision-making muscle. Don’t worry about making the RIGHT move; just make a move. You are unlikely to ruin your life, whatever you decide. I’m telling you to Stop Worrying About The Outcome. The outcome doesn’t matter. What matters is moving forward. Lots of people like choosing a word of the year. I usually forget mine by mid-February, but I like the exercise. In light of what I’ve just told you, and considering the number of great ideas I have every day but rarely bring to fruition, I’ve chosen EXECUTE as my word of the day. Or month. Or whatever. Not as catchy as Just Do It, perhaps, but full of resolution. Okay! Here it is: the time of year for unbridled shopping. You may have a long list, including co-workers, teachers, friends, relatives and neighbors. Before you load all these fine people up with a lot of extra stuff, think for a moment about whether you are gifting them things they will cherish, or merely contributing to their own potential clutter problems. Here is my list of 50 (count them, FIFTY!) things you can give that will not take up space and cause clutter-related trauma to the recipients. Paid dinners from Blue Apron, Sun Basket, Home Chef, etc. A day at the Japanese Gardens, Chinese Gardens, Botanical Gardens, Arboretum, etc. These are all things I would be thrilled to receive! This year, think experiences, think consumables, think services. Useful AND thoughtful. Now go out there and shop, and try not to burden the people you love with a bunch of clutter. What's the best way to do this? Answer: any way you can think of. I have always been terrible at higher math. By which I mean everything past basic arithmetic. Algebra was the worst - I just couldn’t get my head around it. My teachers seemed to rely on repetition as a learning device; they just kept repeating the same explanations over and over, as though the same words would eventually make sense. Fortunately, my father was not only some kind of math genius, but also a gifted teacher. He’d patiently explain the concept, and if I didn’t get it he’d come at it from a different angle. He’d use analogy and example and just keep talking about the concept until I had that light bulb moment. He’s single-handedly responsible for getting me through high school math. This is just the least of what I owe him. This same method can be applied to just about anything: if one explanation or example doesn’t work, try another. Try talking around the problem until something finally strikes a cord. It’s helpful to remember that one strategy does not fit all, and that a method that works well one day may prove less effective the next. This is as true of home management as algebra, and is why I don’t organize FOR you but WITH you, because my best way might not be your best way. If you’re struggling with decluttering, don’t despair! There are a lot of strategies out there, so please don’t become discouraged if one doesn’t seem to be doing it for you. For most of us a combination of approaches is a great way to proceed. You may have heard me say that I finally got good at decluttering when I decided to get rid of five things per day. I was determined to lighten my load of possessions, and occasional clear-outs were not getting me the results I wanted. Slow and steady seemed like a good strategy, and for me it really did the trick. I started a blog to keep myself honest - I didn’t really gain much of an audience, but posting every day was the impetus I needed to keep at it. As you can see, some years I really stuck with it and some not so much. It’s another tool in my arsenal, not my only weapon in the war against clutter. Here are my favorite decluttering actions. Try one, try all, mix and match as you see fit. Just keep working at it, you’ll get there. Set a timer. This is particularly good for big spaces that are really overwhelming. I like to work in 20 minute increments. When the bell sounds you get to stop. Repeat daily. Or hourly! Choose a small area or category. Examples: the medicine cabinet, reference books, spices, the nightstand. I offer a weekly prompt via text with a suggestion for a 15-20 minute decluttering project. You can get in on the goodness by texting the word “throwaway” to 31996. Set a daily or weekly number of items to get rid of. The tricky part is that you have to stick with it! This is a great one to do with a buddy - text a list or a picture of the stuff you’ve jettisoned to one another to stay on track. Accountability can really help keep you going. Make a game of it. There’s a great month-long challenge, apparently invented by dozens of people simultaneously, in which you throw away one thing on the 1st of the month, 2 things on the 2nd, etc. If you stick with it you’ll end up tossing well over 400 items. A great start! Move 27 things. This is based on a Feng Shui principle of moving energy. I like to use this one for tidying as much as for decluttering. Either way, progress will be made. Take pictures! I’m terrible at this one, but I’m working on it. Before and after pictures remind you of how much you’ve progressed. If you’re feeling down you can remind yourself (and everyone else) that you are good at this, dammit! I hesitate to encourage you to spend MORE time on social media, but the kudos you get online can be very encouraging. There you have it, my top tips for slow and steady uncluttering. More in the future about speedy overhauls vs. incremental changes; I have LOTS of thoughts about that. Do You Think It’s Time To Ask For Some Help? “Help! I need Somebody!” Yeah, easy for you to say, The Beatles. Not as easy for most of us. I am pretty good at asking for help when it’s really just advice, but I find it much harder to ask someone to actually do things for me. Things that require them to leave their homes, and spend time or money or other resources. You know, things that might require effort. I was self-employed for a big chunk of my early adult life. One result was that I was in a unique position to offer assistance to my friends during business hours. I could pick them up from the airport at 11:00 am, or get their kids from school at 2:30. I was called upon to wait for the cable guy and to help drop off cars at the repair shop. And I loved it! I have always loved helping people out, sometimes to the detriment of my own business, or family, or sanity. But the asking muscle was one I really had to develop, and have had to continually exercise. I never want to feel that I’m imposing on someone’s time or good nature. I sometimes feel unworthy of those things. I even feel embarrassed at my inability to DO IT ALL, BY MYSELF, ALL THE TIME. As with so many things, necessity was the mother of growth. But I didn’t have much of a choice, so I sucked it up and asked, and the response I got was exactly what you might expect: a resounding yes! From the family with three small boys: our kids are happier and easier to handle when your girls are here! From my childless sister: I had the best conversation with Maddie’s mom at the soccer field! From my boss: the girls are welcome to come to work with you! Everyone helped, and I was reminded of something I kind of already knew; people like to help. It makes them feel good to be asked. So, what does this have to do with you? I’m reminding you that it might be time to ask for some help. I’m asking you to think about how you feel when someone asks you for help, and not just the ride-to-the-airport kind of assistance. I’m talking about when you’re asked to describe your career trajectory to a young woman trying to find her way, when a friend asks you to accompany her to a scary appointment, when someone asks you to use your talent or connections or brute strength to help them with a difficult task. It feels good, doesn’t it? It’s validating. It’s a reminder that you have special skills and superpowers. So let’s remember that asking for help isn’t bothering people; it’s recognizing their inner expert. And then let’s remember that you are likely doing the work of five in your day to day life, and asking for assistance isn’t an admission of failure. It’s embracing the realization that other people are good at things we haven’t gotten around to conquering yet. My business is based on people getting to a point at which they are willing to ask for help. Sometimes they feel embarrassed about having to ask. Sometimes they feel ashamed of letting someone see how “bad” their homes look. But what it says to me is that they’ve realized that none of us can DO IT ALL, BY OURSELVES, ALL THE TIME. If you need help decluttering and organizing your house, call me. And if you need help doing your taxes, or repainting your living room, or getting back in shape or whatever, then find someone who can help and ASK. Because we are all in this together. Hiya! Need a little motivation to get at a decluttering/organizing project? Look no further!